Blue Cat's DXi Manager is a simple free tool that lets you use DXi plug-ins in any DirectX-enabled application. 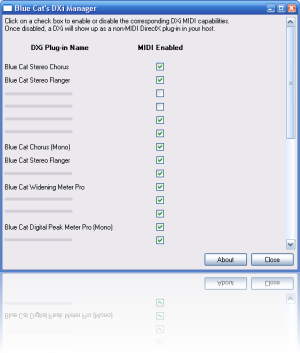 Despite the fact that the DXi format has become a standard in the audio industry, several applications still do not support DXi plug-ins properly: the plug-ins may not be recognized by the host application (not listed) or seen as software synthesizers, even if they are just audio effects with MIDI control capabilities. This handy utility lets you disable the MIDI capabilities of any DXi plug-in so that it's seen as a simple DX plug-in with no MIDI capabilities with a single click. You can of course re-enable the MIDI capabilities as well, which lets you use your DXi plug-ins with optimal support in different applications at the same time. 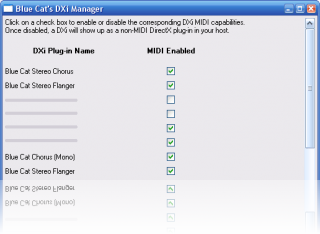 Enable/Disable MIDI capabilities of any DXi plug-in with a single click. No Videos available. Please check our Youtube channel for more videos about this software. "Blue Cat's DXi Manager 1.0 has been tested by the Softpedia labs and found to be completely clean of adware/spyware components." Microsoft Windows 2000 or Windows XP. You need Administrator rights to use the software (note that it has to be run as administrator under Vista). Now uses restricted registry access rights.